Ted Carmichael Global Macro: Equilibrium Real Policy Rates: Does Anybody Really Know? Equilibrium Real Policy Rates: Does Anybody Really Know? While most market participants and strategists focus on when the first Fed tightening will happen, the more interesting question is where should policy rates be now and over the next few years. While it has made virtually no headlines, the debate on the "equilibrium real policy rate" has picked up in recent months. It is one of those debates which is impossible to win, but is very important to understand. "Under assumptions that I consider more realistic under present circumstances, the same rules call for the federal funds rate to be close to zero." Under the original Taylor Rule, the equilibrium real policy rate was assumed to equal 2% (roughly the average historical value of the real federal funds rate). With core inflation at about 1.25%, the inflation target assumed to be 2%, and the output gap close to zero (assuming full employment at the current US unemployment rate of 5.5%), the original Taylor rule calculation would indicate that the current policy rate (Fed Funds Rate) should be 2.875% (or 2% + 1.25% - 0.375% - 0%). But Ms. Yellen argued that "more realistic" assumptions are that the equilibrium real policy rate is equal to 0% currently (as some statistical models suggest) and that the US output gap is -1%, based on the assumption that full employment is reached at 5% unemployment and the Okun's law calculation that y = -2* (U - U*). Hence, using the Yellen assumptions plugged into the Taylor Rule equation, the current policy rate should be 0.375% or (0 + 1.25 - 0.375 - 0.5). Indeed, using statistical model that she refers to (the Laubach-Williams model), which yields a most recent estimate of the equilibrium real policy rate of -0.165%, the Yellen estimate of the appropriate Fed Funds rate currently is 0.21%, or pretty much exactly where it is. Why Has The Equilibrium Real Policy Rate Fallen? A pioneer of the study of the equilibrium real policy rate is John C. Williams, the current president and CEO of the Federal Reserve Bank of San Francisco. Williams calls this the Natural Rate of Interest, which he defines as "the real federal funds rate consistent with the economy operating at its full potential once transitory shocks to aggregate supply or demand have abated". It is no surprise that Janet Yellen uses an almost identical definition of the equilibrium real policy rate as "the level of the short-term interest rate, less inflation, estimated to be consistent with maximum employment and stable inflation in the long run, assuming no future disturbances to the economy". 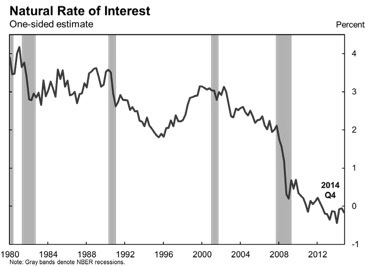 In a March 2 speech titled "The Decline in the Natural Rate of Interest" (see here), Williams laid out his estimates of how the natural rate, i.e. equilibrium real policy rate, has evolved and why it has declined sharply in recent years. The chart below shows how Williams' estimate of the natural rate has evolved. In 1990, the equilibrium real policy rate was estimated to be 3.4%. By 2007, on the eve of the Great Financial Crisis, it had fallen to 2.1%. Following the crisis, it fell below 0% and has hovered there ever since, with the 4Q14 estimate at -0.2%. The Williams-Laubach model estimates the equilibrium real policy rate as a function of the potential or trend real growth rate of the economy and other unspecified factors (which include demographics, fiscal policy, private sector leveraging or deleveraging, and technological change). In the 1990 to 2007 period, the model estimates that of the 1.3 percentage point drop in the equilibrium real policy rate, 0.5% was contributed by the decline in trend growth and 0.8% was contributed by other factors. In the 2007-14 period, the model estimates that of the 2.3 percentage point drop in the equilibrium real policy rate, half of the drop was contributed by the decline in trend growth and half by other factors. While there is no equivalent to the Williams-Laubach model for Canada, it seems clear that the same forces that Williams contends have lowered the US equilibrium real rate have also lowered that rate in Canada. A February 2015 paper by Hamilton, Harris, Hatzius and West (HHHW, see here) provided data on real GDP growth rates and real policy rates for a wide range of developed economies. There is substantial uncertainty about the level the real equilibrium policy rate and its relationship with trend GDP growth is more tenuous than widely believed. Econometric analysis using cross-country data and going back to the 19th century supports a wide range of plausible central estimates for the current level of the equilibrium rate, from a little over 0% to the pre-crisis consensus of 2%. The uncertainty around the equilibrium rate argues for more “inertial” monetary policy than implied by standard versions of the Taylor rule. Given these cautionary conclusions, what might the Bank of Canada be thinking about the appropriate policy rate now and in the medium term future? To attempt to answer this question, we can do the Janet Yellen type calculations for Canada. Since Ms. Yellen will be the Chair of the Fed from now through the medium term, we can assume that her thoughts on the US equilibrium real policy rate will be quite influential (as well as being supported by San Francisco Fed President Williams). Some statements from Bank of Canada Governor Poloz seem quite sympathetic to Ms. Yellen's assumptions and conclusions. For Canada, using the original Taylor Rule, the equilibrium real policy rate is assumed to equal 2%. With core inflation judged by the Bank of Canada to be about 1.7% and the output gap calculated by conventional methods estimated to be -0.5%, the original Taylor rule calculation would indicate that the current policy rate (Fed Funds Rate) should be 3.4% (or 2% + 1.7% - 0.15% - 0.25%). But using "more realistic" assumptions, along the lines of those used by Ms. Yellen, that the equilibrium real policy rate is close to 0% currently and that the Canadian output gap is -1.5%, the current policy rate should be 0.80% or (0 + 1.7 - 0.15 - 0.75), or pretty much exactly where it is. Let's sum this up by saying that according to the original Taylor Rule, current policy rates in the US and Canada should be 2.875% and 3.4%, respectively. However, using the "more realistic" (or, if you like, "more dovish") assumptions that flow from the analysis of real equilibrium policy rates and larger estimates of the output gap, current policy rates in the US and Canada should be 0.2% and 0.8%, respectively, or pretty much exactly where they are. Where will the Equilibrium Real Policy Rate Go Now? Provided that inflation shows clear signs over time of moving up toward 2 percent in the context of continuing progress toward maximum employment, I therefore expect that a further tightening in monetary policy after the first increase in the federal funds rate will be warranted. Should incoming data, however, fail to support this forecast, then the actual path of policy will need to be adjusted appropriately. My review of this debate convinces me of one thing. Central bankers do not have strong empirical foundations for determining the appropriate level of policy rate. Current low policy rates can be rationalized by assuming that the real equilibrium policy rate has fallen sharply and by assuming that our economies are still some distance below full employment. Some economists don't buy these assumptions. But neither side in the debate can prove that the other side is wrong. As long as Yellen and Poloz remain at the helm of their respective central banks, low policy rates and very gradual rate normalization seem likely. An interesting sidebar to the decline in the natural rate of interest is that the inflation target for most central banks may be too low. IMF chief economist Olivier Blanchard has suggested that the typical central target for monetary policy of 2% may result in the zero bound for nominal rates being a too frequent constraint. Raising it to 3% would allow for more stimulus being available if demand conditions falter. Stephen Poloz has recently indicated that an increase could be on the table next year when the bank renews its inflation mandate with the Government of Canada. Nice summary article Michael and the music track accompaniement couldn't have been better!